The remarkable new 3S gondola lift which was officially inaugarated at Zermatt this weekend after 2.5 years under construction will be just the first stage in the creation of a new skiing super region across the Swiss-Italian border of 540km of piste, according to the new chairman of Zermatt's lift company. [b]Tignes has just unveiled the new cabins for its Grande Motte glacier cable car lift, which have been replaced as part of a ?17m upgrade project on the 43 year old lift which climbs from 3034 metres to 3456 metres in five minutes. The new cabins, which have a capacity of 100 people inside, also have the novelty of an 'open top' area outside which can carry another 20 people. Summer skiing ended early in early August this year in order to allow work crews access to the lift before the weather began to deteriorate at this high altitude. A man who is usually confined to a wheelchair has qualified as a ski instructor in Argentina. German Vega is based at Cerro Cathedral, South America's largest resort. A spokesperson for the resort said they believed Mr Vega is the first sit ski user in the world to qualify as a ski instructor, however it later transpired that others in Europe have qualified as instructors. Queenstown ski field Coronet Peak in New Zealand has extended its ski season by one week off the back of great snowfall in spring, continued cold temperatures and demand from locals. Instead of closing this Sunday - 30th September - the 280 hectare ski field will stay operational until Sunday 7th October, closing temporarily on Monday 1st October to reboot for the week ahead. Courmayeur is working on a project to replace its old Youla and Arp lifts at the highest point in its ski area by 2021. The project, the design of which was awarded a European tender in April last year, has an estimated budget requirement of ?19m, which the resort's lift company says it's working on. Austria's Kaunertal glacier (pictured above) will begin the 2018-19 ski season this Saturday, on the last weekend of September. It'll join half-a-dozen already open ski areas in Austria, Italy and Switzerland. Long-standing plans for a large scale expansion of Zell am see's ski area appear to have finally got the green light from the Austrian government. The plans, which involve 23 hectares of new slopes served by four major lifts in the resort's Schmittenhöhe area, were first mooted a decade ago but have been bogged down in the legal permissions process ever since. In an unusual move Verbier has announced a four year 'partnership' with Liverpool Football Club to promote itself in both British and European markets but outside the traditional winter sports community. "It is important to distinguish between sponsorship and commercial partnership. Our operation aims to make our station known and to entice LFC fans through new experiences," said Laurent Vaucher, CEO of Téléverbier. After another successful season last winter, Chambéry Savoie Mont Blanc Airport is pleased to announce its new programme from the UK for the winter season 2018-19. The first snow of the season was sighted on Scotland's highest hills today with snow spotted at Cairngorm (above) and Nevis Range (below) ski areas. The five Highland Scottish ski areas will be hoping for a repeat this winter of the last one, 17-18 which was the best for five years in terms of skier business with 249,848 skier and boarder visits recorded, more than four times the 53,669 total the previous winter, which had been the worst this century. [b]Serre Chevalier, the resort that promotes itself as the largest in the southern Alps, has an unusual new attraction for visitors this winter, a cryotherapy centre in Briançon. "Cryotherapy, long used by top athletes, is well known for its effectiveness in the fields of sports, health and well-being and is increasingly recognised by the medical profession. It is great for athletes for optimal recovery and increased physical performance. It is well known for its ability to reduce symptoms in joint and neurological diseases such as polyarthritis, multiple sclerosis and osteoarthritis. It is also useful in helping post-surgical and post-traumatic recovery. It can also help skin diseases, sleep problems, depression, and vascular problems," a resort spokeperson said. The historic Swiss ski region of Jungfrau has announced a huge 470 million Swiss Franc (approximately £370m) investment to upgrade its transport infrastructure, with the money particularly focussed on upgrades centred on the resort of Grindelwald and its connection to the year round attraction of the Jungfraujoch, Europe's highest railway station and a year-round 'snow fun' destination. Huge spring snowfalls are building in New Zealand with one resort reporting 70cm of fresh snow accumulated as staff left for the day, but with the snow still falling at a rate of up to 10cm per hour. It's springtime and the final 2-3 weeks of the season lie ahead for most of the country's ski areas but this looks to be the biggest snowfall of 2018 by some way for ski areas on the South Island. Following the damage to cable car lifts at Argentiere in the Chamonix Valley following a severe fire on Tuesday, another cable car lift has been badly damaged, this time at the Zugspitz Glacier above Garmisch Partenkirhen in Germany. In both cases no injuries have been reported. Will California or Colorado Open for the 18-19 Season First Next Month? [b]With opening day for North American ski areas rapidly approaching, the usual competition to see which will be first to actually open is beginning to gather pace. Mt Rose ski area in the Lake Tahoe region of California (pictured above) is the first to say it plans to open on a specific date in October ? the 26th ? but several other ski areas may open before then, if conditions prove good as the month progresses, they're just not naming a target day. Read the full Article : Will California or Colorado Open for the 18-19 Season First Next Month? A number of ski areas in South America appear to have called it a day on winter 2018 a little earlier than usual as the limited snow cover has begun to rapidly diminish as spring temperatures begin. La Parva (pictured top yesterday), which had a 30-50cm base and El Colorado (60-70cm), both in Chile, are among the areas that have announced they were calling it a day on the 2018 ski season at the close of weekend skiing yesterday. A British ski travel company has announced it will be offering a ski trip to Georgia in Eastern Europe this winter. Mountain Heaven, which has already branched away from it's core market of holidays to chalets and apartments in the French and Swiss Alps by offering ski holidays to Iran, say their new 'Ski Experience' trip to Georgia will combine skiing a number of resorts, together with visiting a number of interesting destinations in the country, including the capital Tbilisi. Crystal Mountain in Washington State has become the 55th former independent ski run (or formerly run by a previous but now defunct large group like Intrawest) to be snapped up by one of the four current largest multi-ski resort owning conglomerates in the US. Meribel is to have a major new lift in operation in its Chaudanne sector for the coming winter. The new high-speed detachable six-seater Legends chairlift, scheduled to start operations in December, will replace both the former Plan de l'Homme chairlift and the Roc de Fir lift. The recent snowfalls at the start of this week in New Zealand have been some of the biggest of the season so far with storm totals hitting 60cm (two feet) at one area, and taking the season-snowfall-to-date tally past the 3 metres mark at another - the deepest in the southern hemisphere for winter 2018 to date. A club run ski area in New Zealand that has not been able to open for the 2018 ski season due to inadequate snow cover says it will finally open this Saturday 8th September following a 20cm snowfall on Monday. Most ski areas in the southern hemisphere have been open since June or early July and will close for the 2018 season early next month. Over the past decade Austrian resorts have been leading the world when it comes to investing in luxurious new lifts. Of course leading resorts around the world are often spending on superb news lifts, but in Austria there's a notable battle between the leading resorts each winter to see who can unveil the most expensive, plush lift yet. 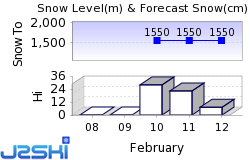 Perisher, Australia, has extended their season to October, following "the best snow in 14 years". Brief, but heavy, snow in Austria intrudes into the hot European summer while southern hemisphere resorts enjoy good conditions. It may be the first day of meteorological autumn (and still three weeks of astronomical summer to run) but it is snowing for the second weekend in a row in the Austrian Alps. The Stubai glacier, due to open for the 18-19 season in the next few weeks, posted pictures of fresh snow again this morning (above), a week after reporting similar falls last Saturday.